Help the brave knights to repel the Forest Ambush! Take the chest of gold and treasure safely back to the castle on the armored cart. When the path through the forest is suddenly blocked by a fallen tree, fend off the Dragon soldier ambush! Draw your weapons, fend off the flick-missile attack and return the gold safely to the castle! Includes 4 minifigures with weapons and accessories: 2 King’s Knights and 2 Dragon soldiers. Last known price is 45% above the initial Lego retail price! 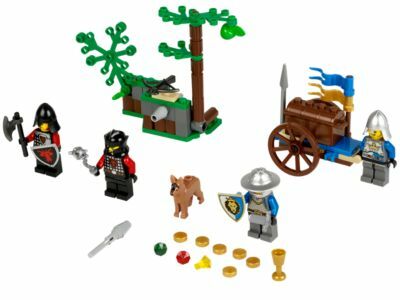 The Forest Ambush (70400) Lego set is no longer directly available from the sites below. However, 3rd party partners of these sites might still have the set available. Alternate description Repel the Dragon soldier Forest Ambush with a falling tree function, flick missile, armored cart and treasure chest with treasure and gold!